The competitive pressure exerted on domestic fashion firms by the increasing presence of world renowned brands is unavoidable, but it could have positive impacts in the long run, experts say. Outside the recently opened H&M store in Ha Noi. They say that the Vietnamese consumer market is growing, and stiff competition could motivate domestic firms to change their production methods and business practices in order to stay in business. Since the early 2000s, a series of world famous fashion houses targeting the middle-income group has entered Viet Nam, including Spain’s Mango, UK’s Oasis and US’s GAP. Sweden’s Hennes & Mauritz (H&M) and Spain’s fashion giant Zara are among the latest entrants in the last few months. Going by anticipation and crowds that these brands have generated in their opening days, it is evident that they are meeting a demand, and domestic firms have no choice but to deal with strong competition. Dang Phuong Dung, Vice Chairwoman, Secretary General at Viet Nam Textile and Apparel Association (VITAS), told the Vietnam News Agency that the emergence of more international brands would compel domestic companies to diversify their products in all market segments. The foreign brands are meeting a real demand, according to Samir Dixit, Managing Director, Brand Finance Asia Pacific. He said in the company’s 2016 Viet Nam 50 Report that foreign brands’ taking over the domestic market is simply inescapable because of the ever increasing gap between consumers’ demand and producers’ supply in terms of volume, quality and aesthetics. As the foreign brands enter Viet Nam, local businesses must be more aware of their own product quality and appropriately change their investment orientations, Dixit said. Dung said most domestic garment producers have focused mainly on exports, chiefly taking on outsourced production. They have not been interested in the huge potential of the domestic market; therefore, despite being one of the top textile and garment exporters in the world, the country has yet to gain much added value, she added. With textile and garment firms tending to specialise in production but not in design, branding and distribution, they will have to adapt fast to be able to compete with the newcomers. The success of grand openings by H&M and Zara can be attributed to good marketing and advertising, but it is undeniable that “fast fashion” (where a new trend or design is quickly produced at relatively cheap prices) is now an established customer favourite in Viet Nam. Its young population and rapid improvement in living standards has made Viet Nam an attractive and fertile territory for international fashion brands. These firms produce wide ranges of clothing for different market segments and sell them at an average price due to diminishing production costs that result from mass production. In the fashion industry, foreign companies tower over their domestic counterparts in terms of capital, professionalism, marketing and customer service, and most importantly, online selling. 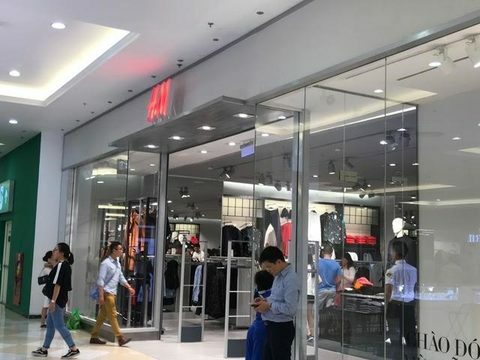 A spokesperson for H&M said the brand spent two years researching the Vietnamese market, identifying key growth factors like a fast-paced economy, an exponential number of fashion-conscious consumers with distinctive tastes, and a surging density of shopping malls. Domestic enterprises have begun placing more emphasis on designing and offering more diverse products of higher quality, and it is even said that Vietnamese enterprises may enjoy some home turf advantage, which enables a cultural understanding of customer habits. However, it is evident that domestic brands remain weaker than their international competitions, as Dinh Thi My Loan, President of the Vietnam Retailers Association, said at a June 2017 conference on identifying retail policy risks. Loan said that more than 200 foreign fashion brands present in the country occupying more than 60 per cent of the market share. She noted that major fashion brands in the world are very interested in Viet Nam because of its high annual average market growth rate of between 15 to 20 per cent. Domestic brands that have made a mark in the market remain confident and hopeful that they will be able to ride the new waves of international competiton. Do Viet Anh, Director of Boo Fashion Trading Co. Ltd, told Viet Nam News that the continuous stream of foreign brands entering Viet Nam’s fashion markets will have some impact on the domestic fashion industry, but they are likely to be short-term impacts. In the long run, such competition is definitely a good dose of reality for the country’s fashion market. It will help alter people’s shopping habits towards branded products instead of non-branded ones, he added. The looming presence of these foreign brands will also help customers compare domestic and global fashion products, and understand that prestigious Vietnamese brands are not inferior, Anh said. Nguyen Tiep, NEM Fashion’s Head of Marketing Department, also held the same view despite the two brands’ different demographics. Tiep told Viet Nam News that his company would implement a business strategy to boost a line of customers’ favourite products in order to increase its competitiveness.